To help protect manufacturers’ pottery designs, the English developed a registration system that was enacted around 1842. They used a diamond with the corners sectioned (below left), each showing a number or letter that you can match to the tables below the diamonds. 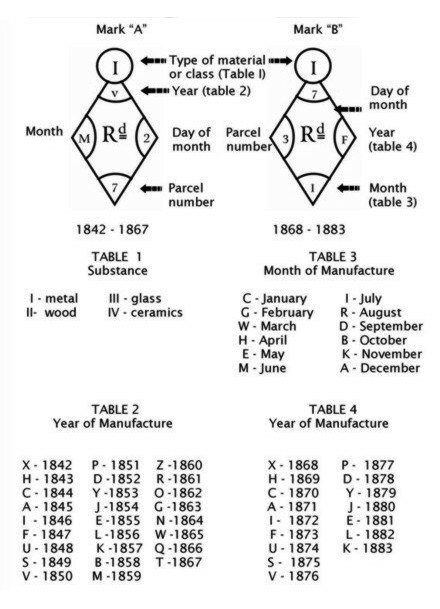 When the system was modified in 1868 (upper right), the tables remained the same, but the location of the information in the diamond changed. Using the chart above, we can date the diamond stamped on the bottom of a piece of pottery to June 22, 1880. In 1883 they changed to a simple numbering system, much like our design patent numbers, which continued to be used until 1991. You may find this diamond on other materials like metal, glass or wood, but it is most frequently found on ceramics since there was a great variety of patterns introduced by manufactures seeking to protect their designs. J. P. Cushion who was the Senior Research Assistant at the Victoria and Albert Museum in London, published a book called Handbook of Pottery and Porcelain Marks. In addition to pottery and porcelain marks for 20 different countries, there is an appendix which shows the registered design owners based on the date and parcel number. The book was last published in 1996. Used copies are very reasonably priced through on-line book sellers.